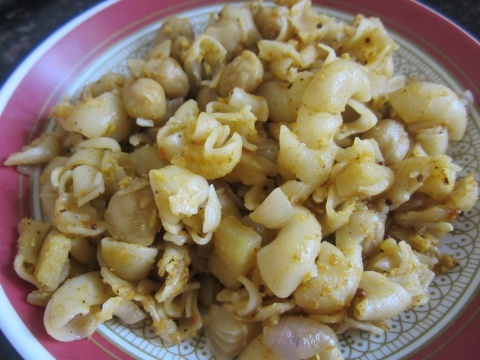 Last night I prepared channa curry and we had some left over curry, so thought to modify it by adding pasta. It was very delicious. Boil pasta for 10 mins and remove from the heat. Drain the water. Heat oil in a kadhai and temper mustard seeds. Add chopped onions and channa masala. Add boiled pasta and salt to taste. Mix well and cook for 10 mins. Serve hot with tomato-chilli sauce.